Everyday, Fortinet protects the networks of over 125 000 organisations in the world. It secures and provides control over their applications, users and data from hidden threats. Its consolidated technologies deliver unmatched performance and visibility. The FortiGate-300C, Fortinet's high-performance multi-threat security appliance, designed to meet the expanding needs of mid-size networks, has won Best Integrated Security Solution at the 2012 SC Magazine Awards. SC Magazine's Integrated Security Solution award is open to products with a fully integrated or unified approach to anti-malware and data and content protection in one box. Designed for mid-size organisations and large enterprise branch offices, the FortiGate-300C integrates key features such as anti-virus, firewall, VPN and IPS, plus many other security and networking functions like Web filtering, anti-spam, WAN optimisation and DLP. It provides constant protection through updates by Fortinet's FortiGuard Network; and it contains an onboard wireless controller, enabling wired and wireless infrastructures to be simply implemented/more secure through a single platform. It can be integrated with a broad Fortinet security ecosystem, including messaging, WAF, database and endpoint security solutions – while the entire security environment can be easily managed and reported using FortiManager and FortiAnalyzer. Integrated security is a neat trick, but with a FortiGate-300C appliance, medium organisations can be ensured that security never becomes a bottleneck. An 8Gbps firewall and up to 4.5Gbps IPSec VN ensures optimal performance of latency sensitive applications, and at a price point of sub-7 000, it gives you the ability to improve security posture and accelerate network performance, while simplifying infrastructure. The FortiGate-300C also enables greater visibility and control over users, applications, and data. Its accelerated security interfaces allows you to create multiple security zones for different networks segments, including departments, users, access methods, or even devices, to enforce network security at accelerated speeds. The functionality, performance and port density of the FortiGate-300C is unmatched among security appliances in its class. The FortiGate-300C not only delivers the best price to performance ratio of any product in its class, it is also a safe investment. The appliance embodies the latest evolution in integrated security from the worldwide leader in this technology. According to IDC, Fortinet has led the market since the beginning, 22 quarters ago. The FortiGate-300C is also IPv6-ready, with strong authentication for secure network access/policy compliance. Its numerous security interfaces let enterprises create multiple virtual domains to segment networks by any logical division, and enforce network security at switching speeds. The “single pane of glass” management console makes it easy for enterprises to deploy and manage their FortiGate-300C. Consolidating security functionality into a single device reduces your network complexity and total cost of ownership. 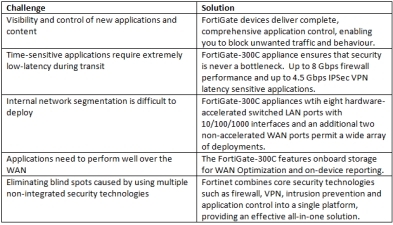 Find out more about the FortiGate-300C.